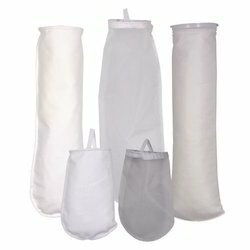 Exporter of a wide range of products which include liquid filter bags. After cutting, flat stock media is fabricated into the filter bag by double over stitching And Or ultrasonic fusing, resulting in a strong and secure seam. A choice of materials for the seal/neck ring can be either polypropylene, galvanized or stainless steel.